Family Camp is a great way to kick off the summer with your family. With exciting programming for kids, teens, adults and toddlers, Family Camp promises to be a week the whole family will enjoy together. Pastor Steve was born and raised in the Ozarks. He came to Christ at a Church of God Camp Meeting in Mountain Grove, MO on his 14th birthday. God surprisingly called him to ministry 9 months later and he started preaching at the age of 15. Steve’s bedrock belief that “a call to ministry is the call to prepare for ministry” (Dr. Gil Stafford) led him to a BA from Gulf-Coast Bible College, a Master’s of Religious Education (MRE) and a Master of Divinity (Mdiv) from Anderson University School of Theology, and a PhD in Character Education (George Mason University). Steve served as a local youth pastor for 13 years and for 4 of those years was a founding member of the National Youth Ministry Team of the Church of God. Steve and his family served as pioneer missionaries for the Church of God in East Africa founding Kima International School of Theology as a training school for the next generation of Christian leaders in Africa. For 14 years the family lived in Indianapolis where Steve loved his role as Lead Pastor of the dynamic, church-planting, missional congregation, The Church At The Crossing (www.golove.org). PLANT new churches, MULTIPLY existing churches, and MOBILIZE all churches for a united and greater mission! The summer of 2019 will be Pastor Steve’s third camp experience at Maple Grove. He has been the Camp Pastor at both the Maple Grove Free Methodist Family Camp and the Church of God in Eastern Canada Family Camp. We are delighted to welcome Steve back! Claude Robold was born in Muncie, Indiana, on August 6, 1945, to Mr. and Mrs. Russell Robold. Shortly after his birth his father entered the pastoral ministry. The course of this ministry took the Robold family to the states of Indiana, Oklahoma, Texas, and Ohio. After completing high school in 1963 in San Antonio, Texas, Claude entered San Antonio Junior College for one year. In the summer of 1964, after surrendering his life to the call of Christ, he enrolled at Gulf Coast Bible College, a Church of God college in Houston, Texas. While at Gulf Coast, Rev. Robold met and married his wife, Jan Rahjes. During his time in school he served with Rev. David Cox, as Associate Pastor of the Southmore Church of God, in Pasadena, Texas, with much emphasis on youth ministry. This involved a lot of traveling for him as he served as a speaker for Youth Camps, revivals, etc. Upon graduation from Gulf Coast Bible College, Rev. and Mrs. Robold moved to Anderson, Indiana, where he enrolled in the Graduate School of Theology. While studying at the School of Theology, Rev. Robold served as Associate Pastor of the East Side Church of God in Anderson with Rev. Dwight Dye. Rev. Robold also did work on his Masters Degree in counseling at Ball State University while serving the church in Anderson. During this time the Robold’s were blessed with their first daughter, Jamie Sue. In 1973, the Robold’s accepted the call to pastor the MacArthur Park Church of God in San Antonio, Texas. The Lord blessed the ministry with tremendous growth in all areas including a fully licensed daycare and kindergarten program. While in San Antonio, Rev. Robold also had the responsibility of a daily fifteen minute radio program, “Morning Praises”, in the San Antonio area. In August of 1975, the Robold family was blessed with their second daughter, Melissa Olivia. In March of 1977, Rev. Robold accepted the call to pastor the North Modesto Church of God in Modesto, California. Some very rewarding efforts were excitingly blessed by God in the areas of discipleship ministries, evangelism, and outreach through a growing day care program. Rev. Robold served as Senior Pastor of the Breiel Boulevard Church of God in Middletown, Ohio, from August 1980, to November 1987. During this time the Robold’s were blessed with their third daughter, Tara Suzanne, born February 17, 1983. Rev. Robold now pastor’s New Covenant Church in Middletown, Ohio, a church he and his wife started in November, 1987. He had assisted in establishing four church plants. He is also involved extensively in ministry in India, Mexico, Latin America and Turkey. Pastor Robold travels annually to India, conducting National Pastors Training Conferences. New Covenant Church has built 40 churches in India; 20 homes for Leper victims, 2 children’s homes, housing over a hundred children. His congregation sponsors over 40 children in India. During the past several years, Rev. Robold has been asked to serve the Church of God in many areas such as International Conventions speaker, conference leader, committee member, Youth Conventions and revival speaker. Rev. Robold served as the Chairman of the Ministerial Assembly of the Church of God in the state of Texas and as Chairman of the Board of Christian Education for Northern California, as well as a member of the Northern California Association Board of Directors. He currently serves as Chairman of the Board of Trustees for Mid-America Christian University in Oklahoma City, Oklahoma and he serves as Vice-Chairman for the India Gospel League North America. He serves as one of six Elders of Southwest Ohio Church of God Ministries. Rev. Robold has been involved in community activities serving on the Board of Directors for the YMCA; Chairman on the Board of Willow Knoll Community Retirement Center and various volunteer positions. Pastor Robold has served as an associate consultant for Masterplanning Group International – a management consultant firm working with non-profit Christian organizations. He also serves local churches and non-profit organization, as a management consultant. Rev. Robold and his wife, Jan, are now entering a new phase of life as they retire from the role of Lead Pastor of New Covenant Church. We look forward to continued services in the Kingdom of God. We will enjoy investing into the lives of our seven grandchildren. In May 2017, delegates from across Canada elected Rev. Dr. Cliff Fletcher to his first term as the Bishop of The Free Methodist Church in Canada. Cliff has a great sense of where the FMCiC has been; it’s strong history, as well as its positive impact potential in Canada. This view of potential is driven by his desire to see spiritual growth in our movement. He believes that while we can build on our history, we must be open to what God has for the FMCiC both today and into the future. Cliff Fletcher has nearly 20 years of experience as a lead pastor at various FMC churches and has been in ministry with the FMCIC for nearly 25 years. Cliff holds a Masters of Divinity from Ontario Theological Seminary and a Doctorate of Ministry from Gordon‐Conwell Theological Seminary. Cliff has a strong vision for the FMCiC including well developed initial thoughts and ideas around areas of change and focus. Certainly, the theme of “team” is a key fundamental element in the way Cliff operates and carries out ministry. Through a focus on discipleship and mentoring, Cliff has been able to facilitate many teachable opportunities and impact many in their Christian and Ministry walks. Cliff is gentle in manner and posture and prayerful in his approach to each situation as he seeks the Holy Spirit for guidance. His experience has helped him develop administrative capabilities, building solid and capable teams around him that have resulted in healthy churches and growth. He has a strong desire to see youth discipled and an increased level of inclusiveness within the FMCiC as we step into an ever changing diverse landscape in Canada. As the role of Bishop is not only a national but international role, Cliff recognizes the challenges that will come with it and is open to them. His bilingual abilities will help in communication with our French speaking communities. Leveraging the talent that already exists within the FMCiC, Cliff is confident that building a strong team will work towards God‐honouring fulfillment of the mission and vision of the FMCiC. Cliff and Karlene have two children, Abigail and Greg. Free of charge … see Bob Cates in the tabernacle at 7:00 p.m. on July 13, Saturday, 2019. Spread the word! “Bob Cates is a Canadian Juggling Champion, clean Christian comedy act and physical variety artist trusted by churches, ministries and parachurch organizations for over 22 years to entertain their audiences without offending them. He keeps audiences laughing with interactive comedy routines involving advanced juggling, wild unicycling and balancing skills, Chinese Yo Yos, black light, lasers, and an insane 21 real plate spinning finale that has to be seen to be believed. The show has headlined for 250 weeks on almost every major cruise line. He’s also performed hundreds of shows for major companies and organizations. Churches and ministries have used the award winning Comedy in Motion show for a wide variety of events and outreaches, for both straight entertainment and also to share the Gospel when appropriate. **During this evening an opportunity will be made to give a donation, for those who are able to contribute towards the cost of the event. For more than 50 years, people have been meeting a living God at Maple Grove. Lives have been transformed. Maple Grove Family Camp is a place where children, teens, and adults have come to have fun and to be touched by God. Countless people have met Jesus for the first time at Maple Grove. And many have rededicated their lives too. Maple Grove has been a place where people have been impacted by the touch of the Holy Spirit. Make Maple Grove a place to get touched by God this year! Each day is set up to provide a mix of both adult and children’s programming, with also plenty of opportunity to spend quality time together enjoying nature and all of the fantastic Family Camp activities. The Family Camp program accommodates families of all ages including newborns and teens. Maple Grove family camp is an awesome place to connect with God and form memories with friends new and old. Anyone volunteering for Family Camp is welcome to come to this weekend. Our first “Plant to Protect” session will be offered on Saturday. 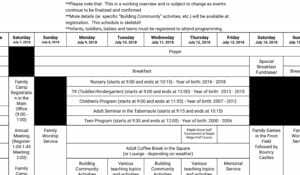 When you register for camp on Saturday, you will receive a full program booklet. This “At a Glance” calendar gives you a general idea of the week’s schedule and activities. A week of family, fun and fellowship, focused on growing closer to Christ. Thoughtful teaching, jumps in the pool, fun with friends, campfire smores, and more!